Each of the fifty chapters has been written by at least two dedicated experts from different European countries. Presenting evidence-based reviews on the treatment of musculoskeletal and autoimmune diseases, the focus is on modern educational goals and techniques. A discount is offered to individuals purchasing from selected low and middle income countries. Please contact our Customer Services team at support@bmj.com or call +44 (0)207 111 1105 to place your order at the reduced rate of €140* including delivery. Posting is via courier delivery to ensure safe receipt. This textbook is the result of joint efforts between EULAR and the Pediatric Rheumatology European Society (PReS). Written by leading European paediatric rheumatologists and based on the EULAR/PReS Online Course on Paediatric Rheumatology, the textbook offers an in-depth analysis of all rheumatic diseases in children and adolescents including their impact on the growing body. It also addresses the differential diagnosis of other paediatric disorders. This textbook is an essential reference for paediatricians, rheumatologists and all professionals involved in the care of children with rheumatic conditions. Purchase your copy today for: €106.50* including delivery. A discount is offered to individuals purchasing from selected low and middle income countries. Please contact our Customer Services team at support@bmj.com or call +44 (0)207 111 1105 to place your order at the reduced rate of €86.50* including delivery. *Plus applicable VAT for the country of purchase. 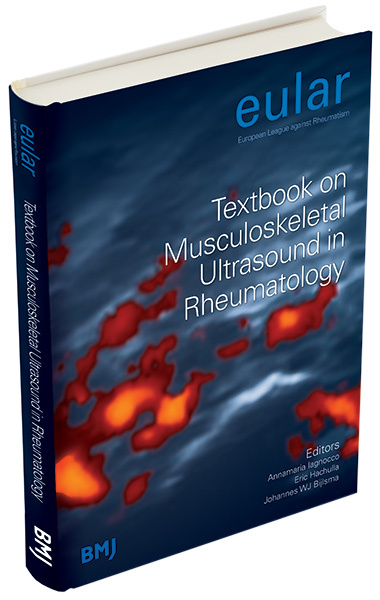 This textbook aims to assist rheumatologists in the use of ultrasound to facilitate important diagnostic and therapeutic decisions. Based on the EULAR Online Introductory Ultrasound Course and written by eminent experts in the field, it includes seven modules with highly illustrative images presented with explanations about the most relevant ultrasound findings. Purchase your copy today for: €66.50* including delivery. A discount is offered to individuals purchasing from selected low and middle income countries. Please contact our Customer Services team at support@bmj.com or call +44 (0)207 111 1105 to place your order at the reduced rate of €56.50* including delivery. This comprehensive textbook encompasses all aspects of scleroderma, from localized to systemic forms, and from pathophysiology to recent advances in evidence-based treatment. 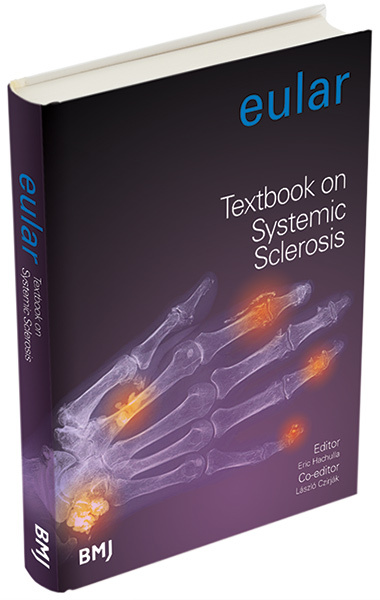 Written by experts from EULAR/EUSTAR and based on the EULAR Online Course on Systemic Sclerosis, the ten chapters deal with different organ systems and cover the management of particular conditions, including life-threatening situations and pregnancy. Copyright © 2019 BMJ Publishing Group Ltd & European League Against Rheumatism. All rights reserved.